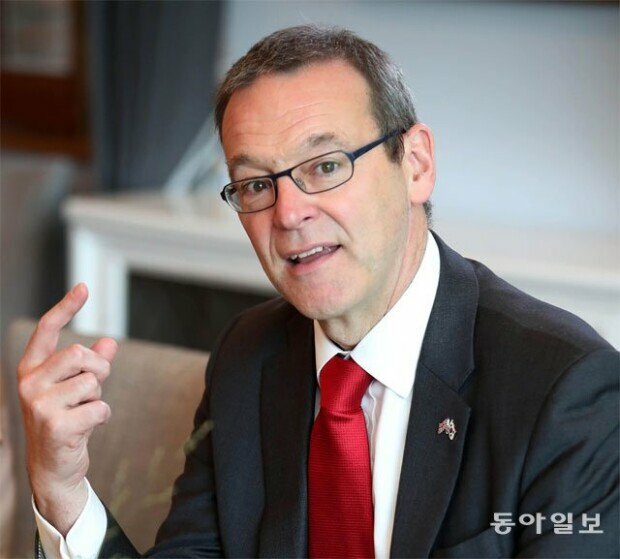 'Kim is rather interested in the denuclearization of S. Korea,' British official says. September. 14, 2018 07:22. wizi@donga.com. Under Secretary Simon McDonald of the United Kingdom's Foreign and Commonwealth Office visited South Korea for the first time to discuss the situation of the Korean Peninsula, Brexit, and pending issues between South Korea and the United Kingdom. The British official assessed the current status of North Korea at a press conference at the U.K. Embassy in Seoul on Thursday saying that North Korean leader Kim Jong Un appears to be more interested in the denuclearization of South Korea than North Korea. When asked whether he sees that North Korea halted nuclear development since the North Korea-U.S. summit, Mr. McDonald, who is also a member of the United Kingdom’s National Security Council (NSC), answered that it needs to be proven by North Korea and it has not been done so up until now. This implies that North Korea is not doing what it ought to do – taking actions for denuclearization. With respect to the third inter-Korean summit that is to be held for four days from Tuesday, Mr. McDonald answered that he understands and supports the position of the South Korean government and that interference policy is an important element in denuclearization discussions and that this summit is also one of such. He also emphasized the importance of pressure policies when looking back on experiences with North Korea and that both interference and pressure need to be incorporated in policies for the hermit nation. He also said that if sanctions against North Korea by the UN Security Council were to be alleviated (to the extent North Korea desires), North Korea needs to show tangible and specific actions. All the good words coming out of North Korea are not persuasive. He added on by saying that nothing has been agreed upon regarding "tangible and specific actions" within the UN Security Council and that it will be able to discuss this issue with North Korea. During the implementation process of North Korea’s denuclearization, the deputy minister pointed out three roles of the United Kingdom – carrying out discussions as a permanent member of the UN Security Council, providing information through the U.K. Embassy in Pyongyang, and providing the nation’s denuclearization technology. In particular, he said that the United Kingdom provided professional information (related to denuclearization) to South Korea. On the other hand, he spared his breath on the specific roles the United Kingdom actually has during the process of denuclearization negotiation between the North and the United States. He said that the United Kingdom made suggestions to various parties and that we will be able to know whether such suggestions were accepted or the way they were accepted.